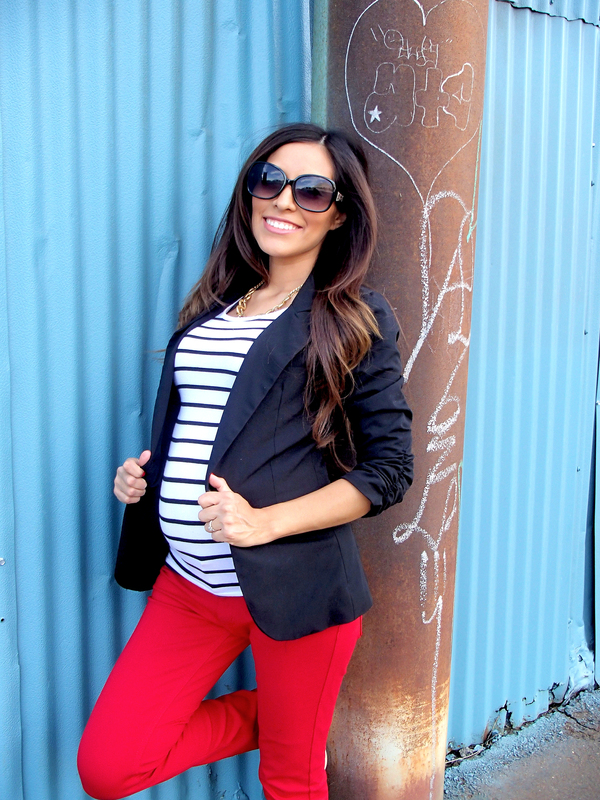 We are super excited to introduce you to chic mom Karen Zaro; she will be our new pregnancy fashion expert bringing you tips and tricks to stay looking mommy chic during your pregnancy. Hello Ladies, I’m Karen Zaro from MyChicBump.com, the style blog for all the stages of motherhood, especially during the difficult-to-dress months with a baby bump. For pregnant women with a very pregnant body, getting dressed can bring up a lot of anxiety and we start fixating on our perceived figure flaws. I’ve been there,we’ve all been there. But it all comes down to choosing clothes that better accentuate what ís most beautiful about pregnant women, our baby bump! I’m thrilled to be partnering with Mom’s Best Network to bring you all my favorite tips, tricks, and outfits to make sure you stay chic and classy during, and even after your pregnancy. As a woman we put so much effort into building up our wardrobe and making it our own so that it will reflect our style and personality. So during my first pregnancy I was definitely not looking forward to stashing away all my cute clothes for 9 whole months! I was skeptical to go into maternity stores at first, because I didn’t want to feel forced into the maternity clothing world quite yet. I wanted cute clothes that reflected me, while being functional at the same time. At first I hung on to my regular clothes for as long as I could. 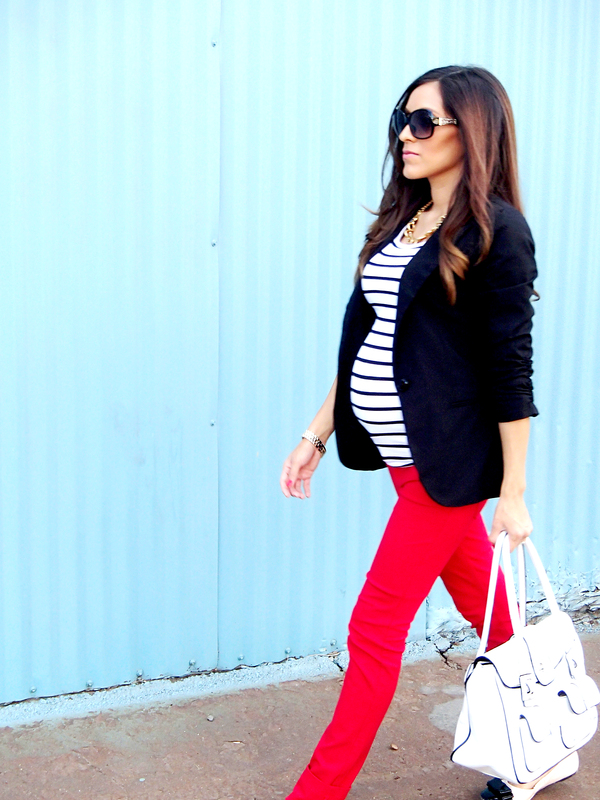 But I†soon realized that the trick is finding pieces that fit your personality whether you are pregnant or not. Two signatures of my personal styles are wearing structured tops like this fitted black blazer, and using color to add some playfulness and fun to an outfit. With this outfit the fitted jacket draws attention away from my less-than-flattering-sides and make me appear narrower. And the dark color also has a slimming effect on the body. The shirt is really stretchy which makes it extra comfortable over my growing belly, while the stripes add some fun lines to break up the other solid colors I’m wearing. 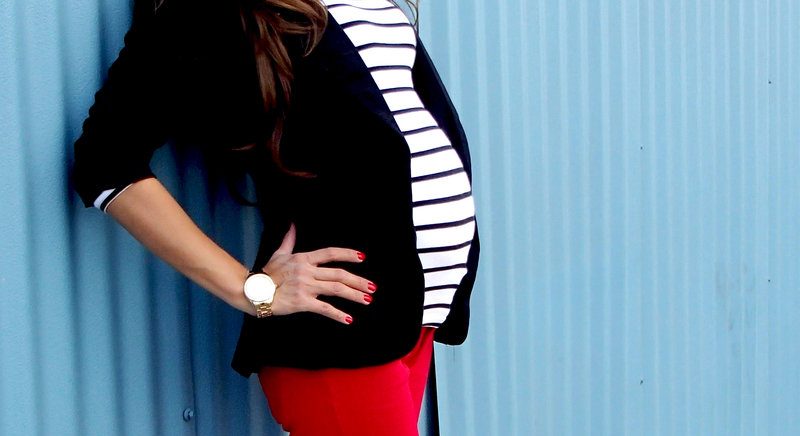 These colored jeggings are also stretchy, especially around the waist so they should work well into the third trimester for most women. 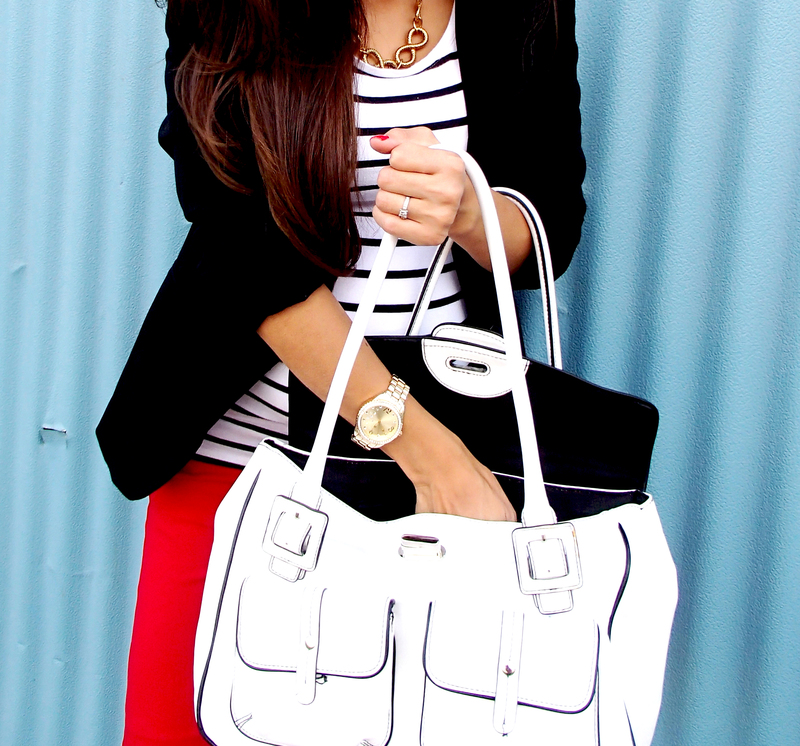 The red color pulls the whole thing together with a great splash of brightness. The whole look is easy enough to throw on and run errands, comfortable enough to play around the playground with your kids, and stylish enough for a date night with the hubby. This is just one of many great examples of how to look effortlessly chic and be comfortable, not only in your clothes, but also in your growing body. I love her blog! She is seriously so beautiful and has the best style! Hi Maritza so glad you found Karen…happy to be working with her…best of luck with your pregnancy! Could not be more excited to be a part the Mom’s Best Network family and work along sides with these incredible women! Thank you for the opportunity. And thank you all so much for your sweet comments! Let’s embark on this new adventure together! Karen I absolutely really like your style!! You look absolutely gorgeous! !